Special education teacher interview questions and answer advice. These educators deal with many unique challenges on a daily basis. Candidates need to demonstrate in the job interview that they are specialists in their field. You will be asked many general teacher interview questions but you will also have to handle interview questions that are specific to special education. 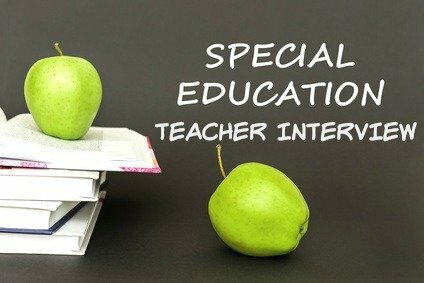 Typical teacher interview questions for jobs in special education will explore competencies related to classroom management, handling difficult students, the special education strategies and techniques you are familiar with and your ability to motivate and encourage students. How have you established procedures and rules for behavior to maintain order among your students? Effective classroom management depends on providing the structure and routine required by special education students. The students need to know what rules and procedures apply to them. Specific and clear communication of these rules and procedures is key. Each student needs to know on a daily basis exactly what is expected of them. How have you managed a very disruptive student? Students with different special needs demand varied approaches to discipline. Provide examples of at least two different approaches you used that were effective for the particular students in question. Focus on your attempts to understand what the problem behavior really means as well as how to modify it. How have you collaborated with general education teachers to benefit your students? Highlight your role on the team as an advocate for your students. Emphasize your ability to work collaboratively with other teachers and support staff to help your students succeed including regular consultation regarding progress towards educational, social, emotional and physical goals. Demonstrate that you act as a valuable resource for the general education teachers by providing specialized activities, modifications, IEPs for your students. What special education strategies and techniques have you used to help your students? Highlight your expertise in differentiated instruction when answering special education teacher interview questions. Discuss development of individual educational plans (IEPs). Give specific examples of modifications, group work, assessments and explicit communication techniques. Show your understanding of the different classifications such as speech disorders, ADD, emotional disorders and language processing difficulties. You will be expected to have basic knowledge of a wide range of disabilities. What methods do you use to encourage students to explore learning opportunities? Often students are not motivated to learn, particularly when they feel inadequate or have experienced failure. What creative methods have you successfully used to build motivation? You have to be innovative in coming up with new ways to build the students' self esteem and belief in the possibility of success. How do you motivate students to persevere with challenging assignments and tasks? Your ability to motivate students will be carefully evaluted with special education teacher interview questions. Student motivation to complete tasks can be enhanced through making positive changes to the learning environment, increasing the interest of the activity, analyzing the task to identify areas of concern, responding to individual limitations and strengths and providing appropriate reinforcers or rewards. Provide a specific example to support your answer. How do you teach and encourage socially acceptable behavior from your students? Include elements such as assessing the cause of unacceptable behavior to design a behavior support program, clearly describing and demonstrating what is acceptable and unacceptable behavior and explicitly communicating the consequences of this behavior. Provide supporting examples. How have you encouraged parental involvement in student learning? Ongoing communication with the family fosters a supportive relationship. This includes providing a clear explanation of the student's IEP, regularly sending out IEP report cards on student progress towards set goals, management of expectations by providing clear measurements, keeping accurate records of interactions with parents and really listening to parents. How have you ensured that each student receives the right type of support? Show how you determine where each student is and prioritize learning accordingly. The focus may be on developing basic social skills or on task completion. 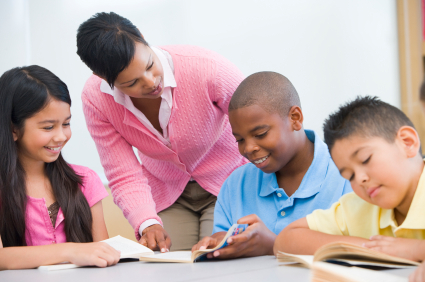 Highlight your ability to use different teaching styles and resources to meet diverse needs. How do you regularly assess the progress of your students? Your experience of student assessments will be explored with these special education teacher interview questions. Show that you have in-depth experience and knowledge of a variety of assessment techniques. Demonstrate how you adapt the assessment to make it appropriate to the student's needs, strengths and limitations with specific examples. How have you managed to keep up with the paperwork required of a special education teacher? Focus on your planning and organizational skills. Provide an example of the time management techniques you utilize. Demonstrate your understanding of the need for the large amount of administration (including Committee on Special Education meetings) and paperwork involved and your willingness to take accountability for the process. Should students with special needs be mainstreamed as far as possible? Before your interview read up on the school district's procedures for determining which students need special education services. Find out what services and resources are available in the school for special needs students. Read up on the latest inclusion strategies. Be prepared to support your answers to special education teacher interview questions that explore your teaching philosophy with hard facts. How do you stay current with special education best practices? Demonstrate your knowledge of federal and state special education regulations, current trends and research in the field of special education. Give examples of your commitment to ongoing professional development through attending workshops, seminars and courses. Why did you become a special education teacher? There are no right or wrong answers to this special education interview question. Research shows the common reasons for becoming a special educator include coming into contact with someone with special needs when growing up. This encouraged the educator to value and understand the challenges faced by children with special needs and to want to help. Other reasons include a desire to find meaning and significance in a career by making a positive difference in a child's life and the stimulation and rewards associated with the challenges of working with students with special needs. Special education teacher interview questions that explore your personal motivations and qualities for the job. Be prepared to answer these frequently asked special education teacher interview questions and stand out as the right job candidate. The teaching interview guide for general teacher interview help and advice. Prepare good questions to ask in your interview. Use the examples at teaching interview questions to help you. Always send a thank you letter after your job interview. 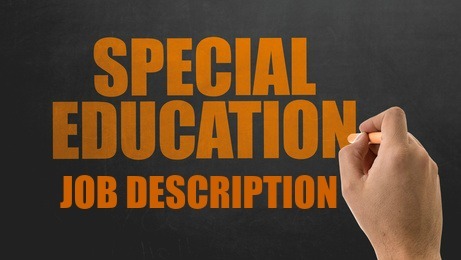 Find a comprehensive list of the tasks, responsibilities, skills and competency requirements for this job at the special education teacher job description.